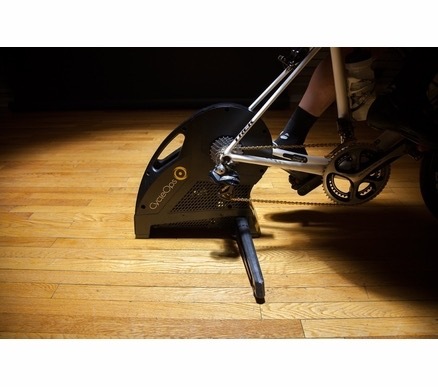 Review "This was my first smart trainer. Works great and syncs right up with my computer. The only reason that I'm not giving it five stars is because, twice out of maybe fifty rides, I've had to reset it due to watts and elevation figures freezing up on the screen and not changing with increased effort or elevation. Other than that, it's been great. Folds up very compactly, and the resistance is great. One suggestion, buy a training tire also. They're much quieter, and won't lose grip on the drum like my conti 4000 did." "Trust me, if you despise training indoors (because you have to due to bad weather) and want to get a specific workout, this is a light at the end of the tunnel. Coupled with Zwift or any other training apps, the time flies because it's stimulating, engaging, and fun. Set up is easy. Once the preferred cassette is installed, mount the bike on the drive train, plug it in, and set up your devices. The Hammer was recognized by my Garmin 520 and ANT+ dongle quickly. Power output accuracy is spot on as well and very close to what my Stages Power Meter is reading."